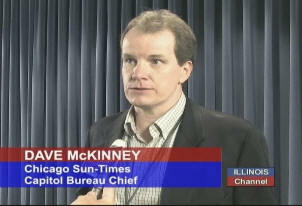 As a result of his bosses’ complete capitulation in the face of a Bruce Rauner attack on he and his wife, Sun-Times political reporter Dave McKinney resigned today. It is, indeed, a sad day for the Sun-Times and for journalism in general. I keep trying to tell you all that most of the current newspapers wounds are self-inflicted – the Net just makes those wounds bleed more – and this scenario is certainly proof positive. I tried to link to this resignation letter on McKinney’s blog, but since that failed after a number of tries, you can find the entire text below. In my wildest dreams I never thought I’d ever say these words, but I will be voting for Pat Quinn and I would encourage you to do the same. I’ve worked for almost two decades at the Chicago Sun-Times because it had a soul. The home of eight Pulitzer Prizes, this newspaper once set up a tavern to expose graft at City Hall and later listened to a grieving mother who wanted justice for her late son after the system failed her miserably. It has stood for hard news. It has stood for independence. The Sun-Times is stocked with dedicated reporters, editors and columnists, who work every day with integrity, long hours and not enough pay. They are more than colleagues. They are my friends. They are my family. They are the soul of the Sun-Times. But today, I’m faced with a difficult decision due to the disturbing developments I’ve experienced in the last two weeks that cannot be reconciled with this newspaper’s storied commitment to journalism. At issue is the Sun-Times/NBC5 report about LeapSource and its fired female CEO, a story for which I proudly shared a byline with Carol Marin and Don Moseley. The piece focused on litigation involving the former executive, who alleged Bruce Rauner, while a director of the company, threatened her, her family and her future job prospects. With the backing of our editors and supported by sworn testimony and interviews, the piece took us nearly a month to vet, report and write. It was approved by the legal departments at both the Sun-Times and NBC5 and was posted online simultaneously with Carol’s Oct. 7 broadcast report on NBC5. It was a Sun-Times story done in the finest traditions of the paper. Prior to publication, the Rauner campaign used multiple tactics to block it, including having campaign staffers vowing to “go over” our heads. We are accustomed to such tactics. But what does not come with the territory is a campaign sending to my boss an opposition-research hit piece–rife with errors–about my wife, Ann Liston. The campaign falsely claimed she was working with a PAC to defeat Rauner and demanded a disclaimer be attached to our story that would have been untrue. It was a last-ditch act of intimidation. Yes, Ann does political consulting work for Democrats. But she has not been involved in the Illinois’ governor’s race and has focused on out-of-state campaigns. She and her business partner have gone to great lengths to prevent potential conflicts of interest, including creating a legally binding firewall that prevents Ann from participating in, strategizing in, or financially benefiting from the Illinois governor’s race. For that work, her partner formed a separate corporation with its own bank account that didn’t involve Ann in any way. In January, before we were even married, I presented this information to Sun-Times management and received approval in writing to move forward. Yet despite such strong rebukes, two days later, I was yanked from my beat as I reported on a legislative hearing focusing on Gov. Pat Quinn’s botched Neighborhood Recovery Initiative. My reporting for that day was then removed inexplicably from the Sun-Times website. I was told to go on leave, a kind of house arrest that lasted almost a week. It was pure hell. Kirk told me that his bosses were considering taking me away permanently from the political and Springfield beats. He offered up other potential jobs at the paper, all of which I considered demotions. Because of my unexplained absence from my beat, colleagues started calling, asking if I had been suspended. Or fired. Through all this, I simply wanted to get back to my beat, but the paper wouldn’t let me. And, Carol and I were instructed not to contact you or Tim Knight about the Rauner campaign’s defamatory allegations. Yet, on the first day back, I was advised I shouldn’t have a byline on a LeapSource-related story “right out of the gate” even though it was a legitimate follow-up to our initial story. While later relenting and offering me a contributing byline after I protested, the newspaper had failed an important test: It was not permitting me to do my job the way I had been doing it for almost two decades. Was all this retaliation for breaking an important news story that had the blessing of the paper’s editor and publisher, the company’s lawyer and our NBC5 partners? Does part of the answer lie in what Kirk told me – that you couldn’t understand why the LeapSource story was even in the paper? Days later, the newspaper reversed its three-year, no-endorsement policy and unequivocally embraced the very campaign that had unleashed what Sun-Times management had declared a defamatory attack on me. Readers of the Sun-Times need to be able to trust the paper. They need to know a wall exists between owners and the newsroom to preserve the integrity of what is published. A breach in that wall exists at the Sun-Times. It’s had a chilling effect in the newsroom. While I don’t speak for my colleagues, I’m aware that many share my concern. I’m convinced this newspaper no longer has the backs of reporters like me. I appreciate the recent, public statements of support by Kirk, an honorable man with solid news judgment who got the LeapSource story into print. But, ultimately, I don’t believe he called the shots here. We reporters have a healthy suspicion of both parties and candidates. It’s our job. It’s regrettable that this issue has emerged in the homestretch of an important election in Illinois, but respectfully, this isn’t about either candidate or the election. It’s about readers and their trust in us. So my decision could not wait. I hate to leave, but I must. And so, it is with great sadness today that I tender my immediate resignation from the Sun-Times. gets printed in the papers? C’mon, Jeff ! Maybe there’s some credibility in LOCAL news, but “credibility’ in ANY paper that publishes much of the AP politically-correct propaganda is not to be completely trusted. If you like Illinois the way it is currently mis-ruled, give it to Quinn for another four, miserable years of failure. As for me, I am willing to gamble on a change of leadership, rather than to continue on with this current guarantee of disaster. Nope, I have to go with ethical behavior. Im not thrilled with Quinn but he is an ethical man. Quinn gets my vote. I could never vote for a man like Rauner. The Republican party has itself to blame for another 4 years of Quinn. Once again they chose the candidate in the primary least likely to win the general election. The one who’s trying to buy the office, promising things he knows he can’t deliver. His tax plans would unbalance the budget even worse than it is now. Quinn will soon be just an unhappy memory. He can look for a REAL job.